Size: 6.3" x 3.2" x 1.25"
The Palmtronic F-6 continued the scientific line of calculators sold by Canon. It is the direct successor of the F-5 and uses again a "TI-less" calculator brain. The major design in the housing was continued with calculators like the F-2, LD-10M, Palmtronic F-31 and LC-8M. 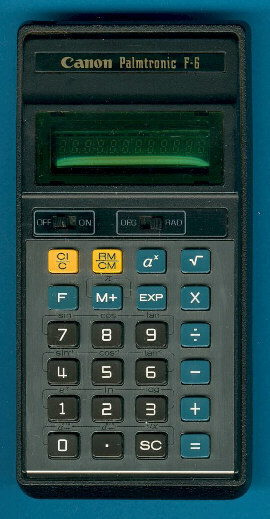 The top of the scientific calculators sold mid of the 1970's was the desktop series Canola F-10 and Canola F-11. Both used again a calculator architecture developed by Hitachi. Later scientific calculators like the Palmtronic F-51 and Palmtronic F-71 missed again the TI brain. Don't miss the Toshiba SC-7100, a direct competitor of the F-6. Running Mike Sebastian's "Calculator forensics" gives an unacceptable bad result of 12.199423 instead the expected value close to 9.0000. But even Texas Instruments failed one time with their algorithm, don't miss the rare SR-40 prototype. ln(ax) = x * ln(a) to calculate the xth power of a.